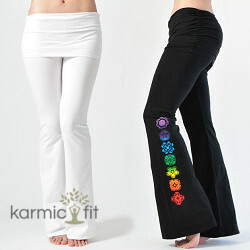 Karmic Fit for stylish Yoga fashions! : Comfy, stylish and just plain cool! You are here: Home / Beauty and Fashion / Karmic Fit for stylish Yoga fashions! Karmic Fit for stylish Yoga fashions! Comfy, stylish and just plain cool! Looking for comfortable yet stylish Yoga clothing? I recently received a pair of Pranayama Gathered Waist Fold-over Womens White Yoga Pants by Jala from our new friends at Karmic Fit and just love how comfy and stylish they are! You can be comfortable and look cool all at the same time! They are great to wear to the Yoga class and they are also stylish enough to wear casually. These are definitely a Must-have for the Spring and upcoming summer! Great for women of all ages and they do come in Black and Ink Blue as well. These really are my favorite new yoga pants! Check out these and many other stylish yoga fashions at Karmic Fit. (You can simply click on the ad in our sidebar too!) You can also find them on Facebook! Self Disclosure: I received a product for free to facilitate this feature but any opinions expressed are my own and completely truthful. These look awesome! I will check out the website. These tools are slid into the gap found behind the panel.